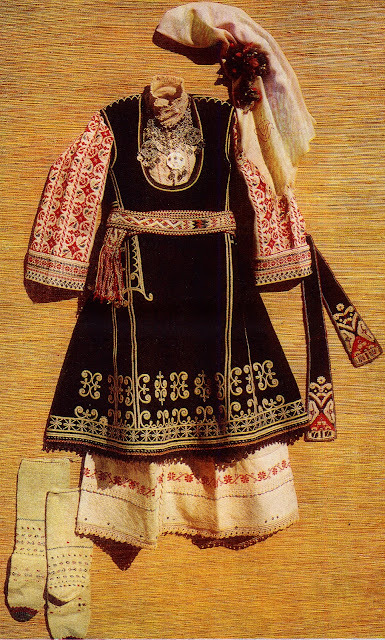 Today I will talk about the costume of another country, Bulgaria. 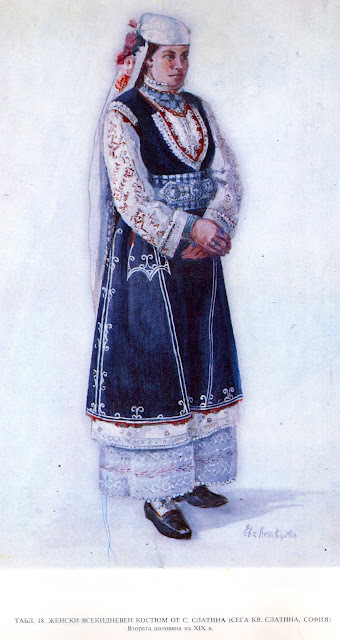 This may be considered the national costume of Bulgaria because it is found in the towns and villages around the capitol, Sofia. Above you can see a stage version of the costume on the women. The musicians are wearing a very different costume. 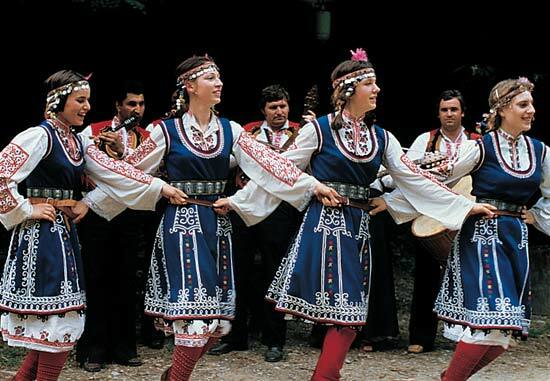 In matters of Traditional Culture and Folklore, especially for music and dance, Bulgaria is generally divided into 7 regions. None of these is reflected politically. 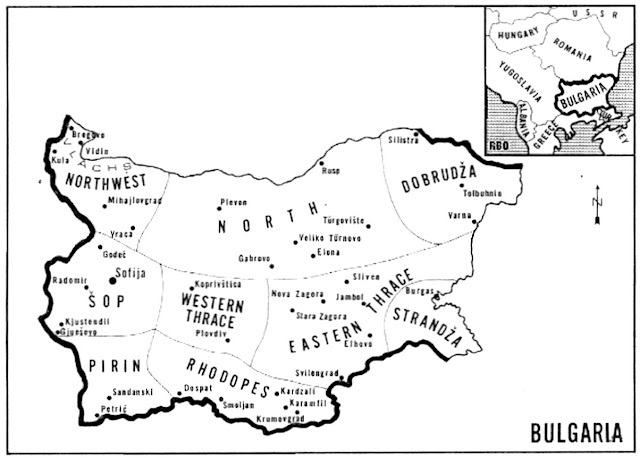 Bulgaria, like so many nations, has instituted administrative districts which in no way reflect traditional regions. Here is a map of the traditional cultural regions. These regions do, in a general way, follow the physical features of the country. Severnjashko is the region north of the Balkan mountains, known in Bulgarian as Stara Planina, and south of the Danube. In the map above, this region is divided into two, North, and Northwest. Musically, this region is characterized by a predominance of 4/4 time, fast tempos and simple melodies. Dances are light and energetic and many have simple arm swings. Dobrudja is the region around the Danube Delta, and extends into Romania. The tempo is slower, the dances are heavier and more earthy. There are many complex arm movements and stamps involved. Thrace is the great lowland south of the Balkan Mountains and north of the Rhodope Mountains. 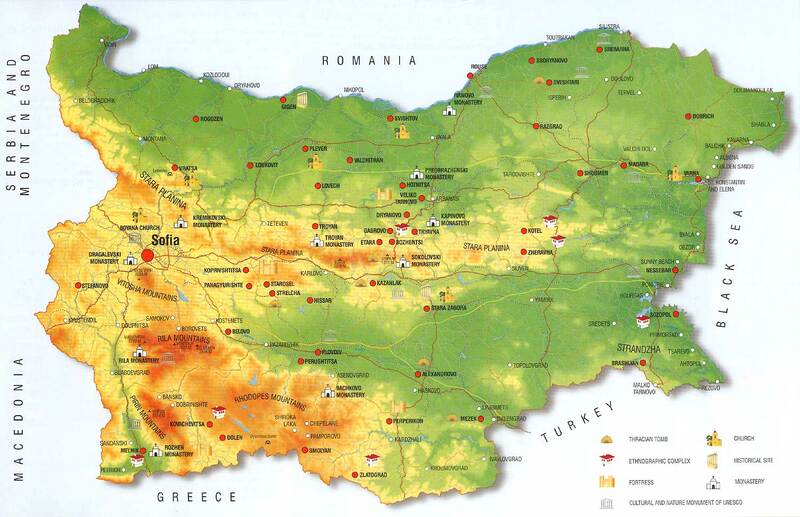 Thrace also includes neighboring areas of Turkey and Greece. Dances are of intermediate tempo, many in the west have complex asymmetric rhythms, Simpler rhythms such as 4/4, 5/8. 7/8, 9/8,11/16 are commonplace, as in the rest of Bulgaria. The tempo tends to slow as one moves east. This may be thought of as 'typically Bulgarian'. Strandzha is the coast of Thrace, and is characterized by very lyrical melodies, soft yet earthy dance styling, and slower tempos. The Rhodopes are the mountains in the south. They are famous for being the homeland of Orpheos [Orpheus in Latin]. This region is famous for the beauty of their songs. Tempos are slow, melodies are very lyrical, and the harmonies are spectacular. Pirin is a small area around the Pirin Mountain in the southwest. 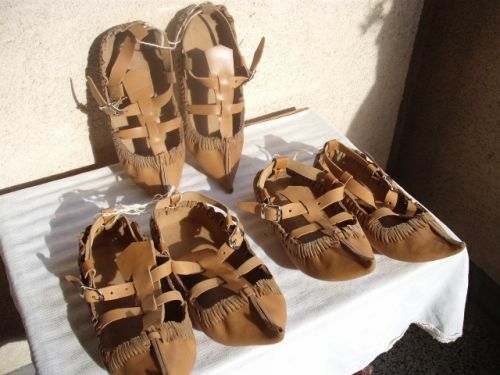 This is culturally considered to be part of Macedonia. Much music is in 7/8, although many other rhythms are also used, some very complex, such as 11+7/16 [Elerinka]. The remaining region is the one which I will address today, Shopluk, Шоплук, or Šopluk. 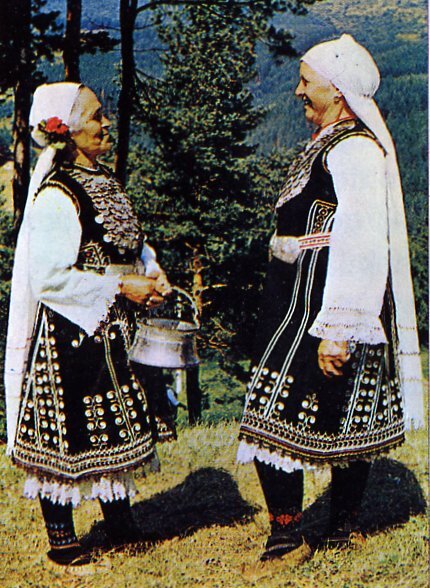 The Šop region comprises the highlands north of Pirin and Rhodope and south of the Balkan Mountains. It includes the region around the capitol of Sofia, and extends somewhat into Serbia and Macedonia as well. 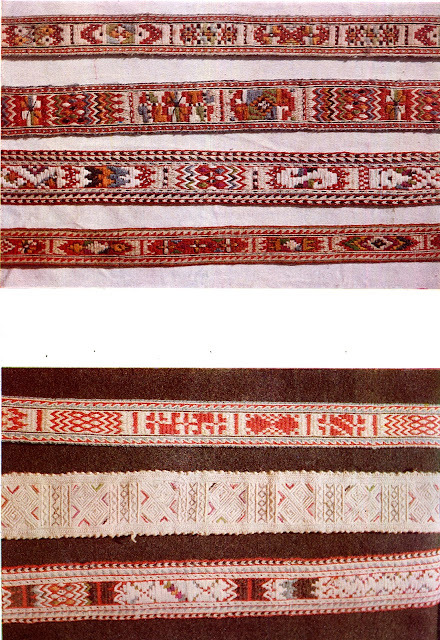 Šop music is characterized by fast tempos and staccato beats. The local songs tend to harmonize on minor 2nds, which can be spine-tingling. The dances are very upbeat, vigorous, and tend to vertical pistonlike motion away from the earth. Here is an article on the Shopi. This defines Shopluk in terms of the dialect, and so is showing it to cover a much larger area than I have indicated. This is one version of the Šop costume. The base is a chemise, called riza in Bulgarian. 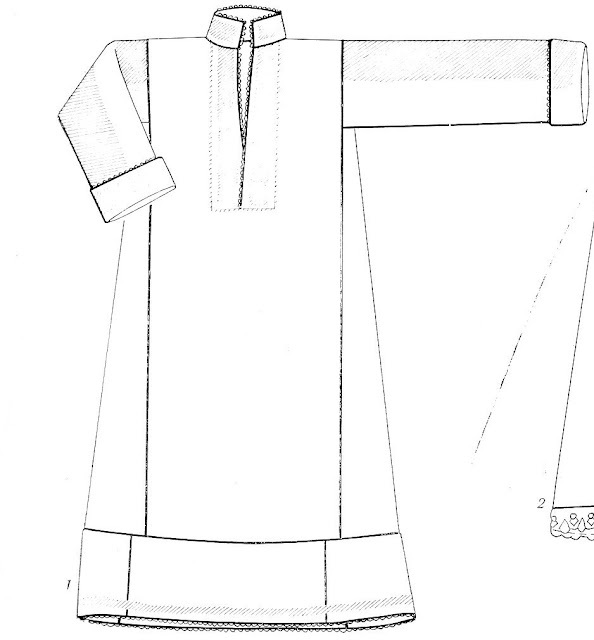 There is embroidery on the collar, front opening, hem, and especially the sleeves. 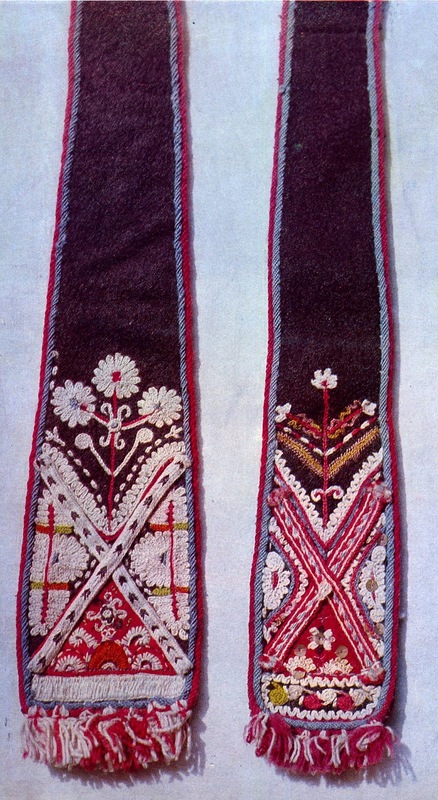 There is quite a bit of variety in the sleeve embroidery. 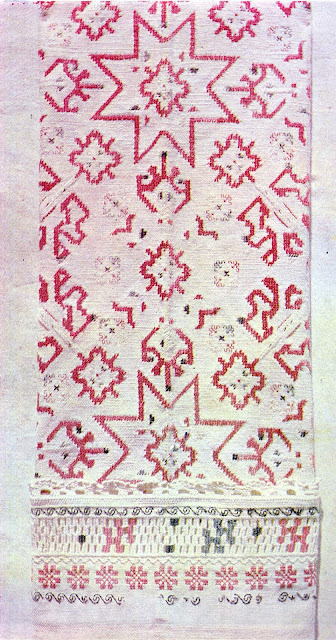 The main colors of the embroidery used are red, white, blue, sometimes black, and occasionally small amounts of yellow and green. Embroidery covers all of the outer sleeve, and the cuffs are typically turned up. I will go into more detail of the embroidery later. Here is one typical example. Over the riza is worn a Soukman. 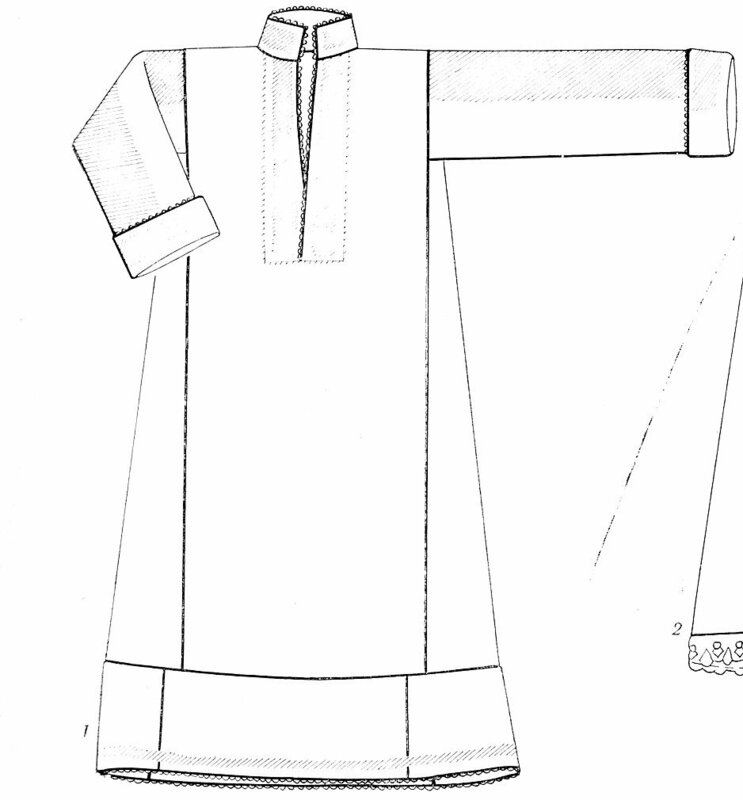 This is a type of jumper, made of wool, which pulls over the head. This is the most common type of Bulgarian costume. 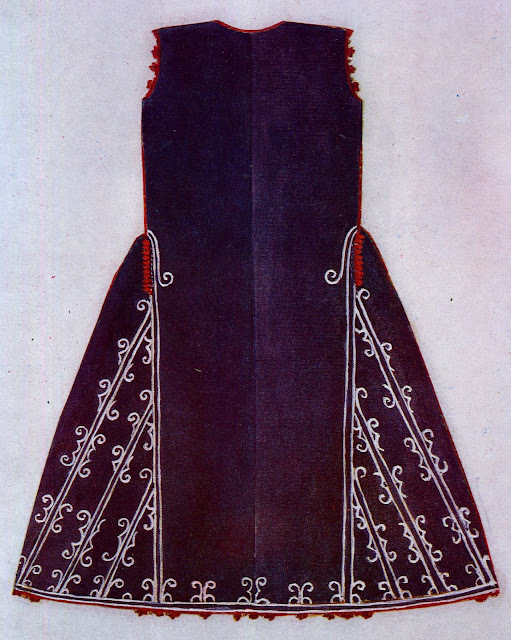 The Soukman may be black, as in most of Bulgaria, but in the Sofia region, it may also be dark blue. 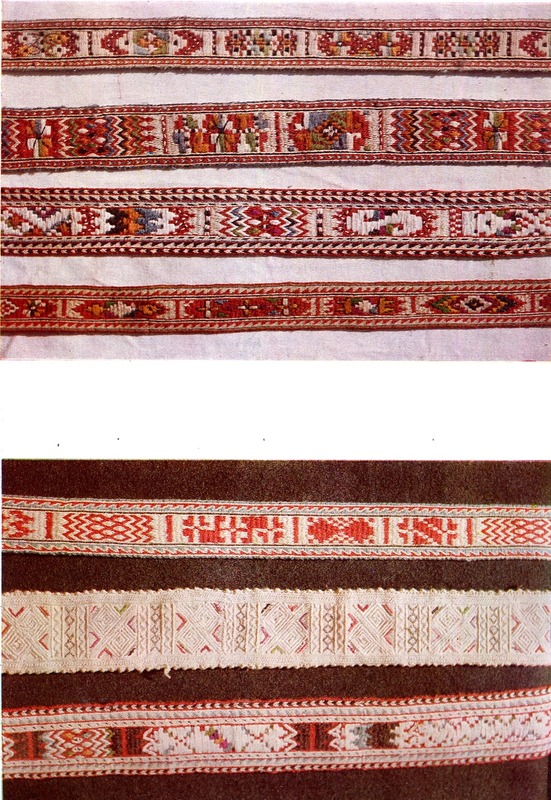 It is ornamented with wool braid around the openings, and has curvilinear white embroidery which is quite unique, not found in other areas of Bulgaria. There is often embroidery on the hips, especially around the pocket. 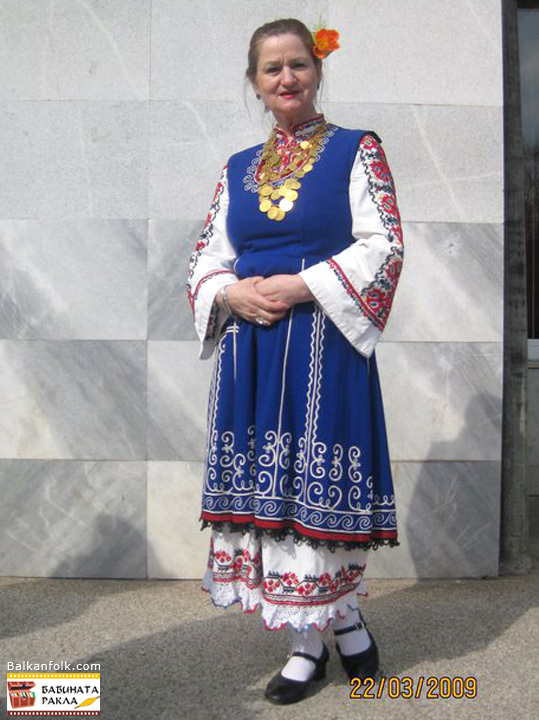 While in some parts of the Šop region the soukman has short sleeves, like in Kjustendil, around Sofia it is sleeveless. The chemise always shows beneath the soukman. 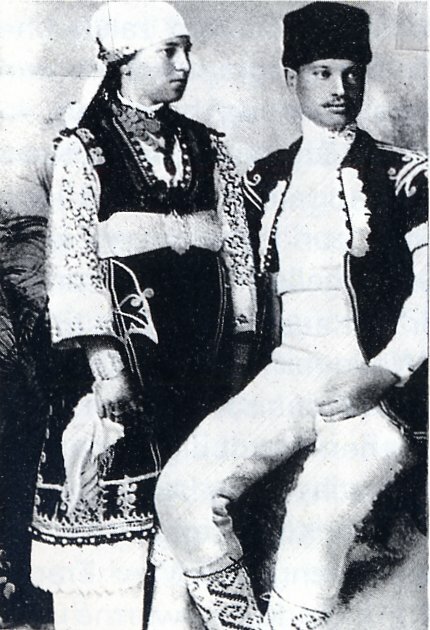 For some occasions, both the riza and soukman may be layered, that is, more than one of each may be worn. The hem of the riza may have false secondary and even tertiary hems sewn on. 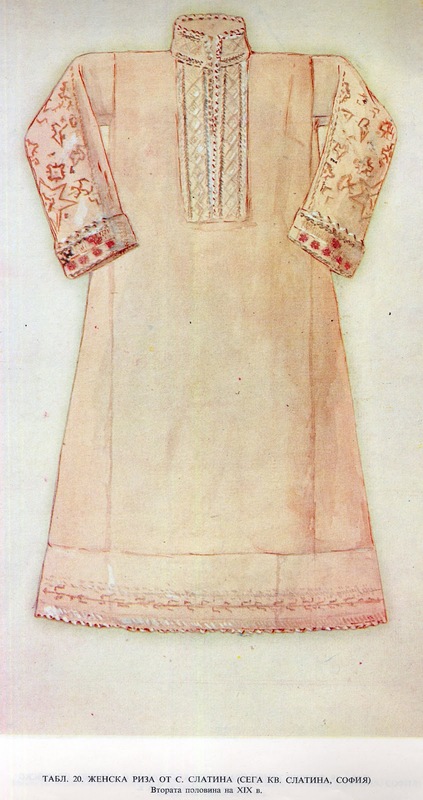 The second outer garment may be highly embroidered, as in this example, or plain black, as in the image further above. Unusually, an apron is seldom worn with this costume. Some of the other Shop costumes also lack aprons. 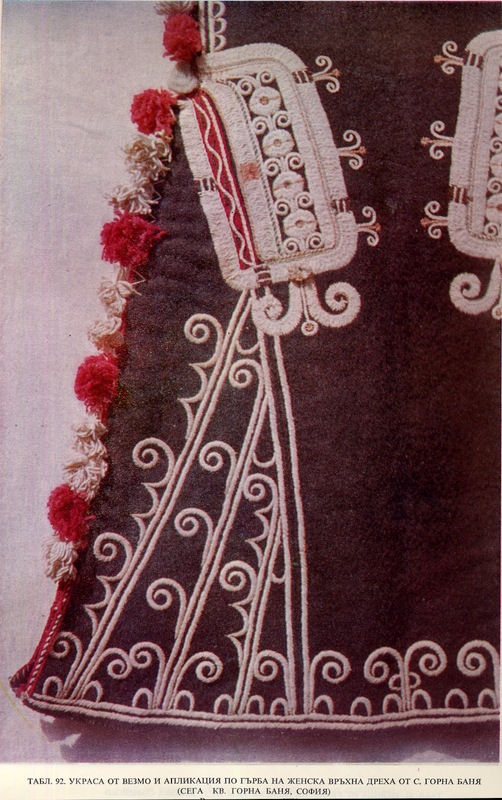 A belt or sash is worn with this costume, sometimes just a woven band, sometimes embroidered. Formerly, there were two streamers attached to the shoulders in back, the ends of which were embroidered. These were the remnants of sleeves, and have now disappeared completely. 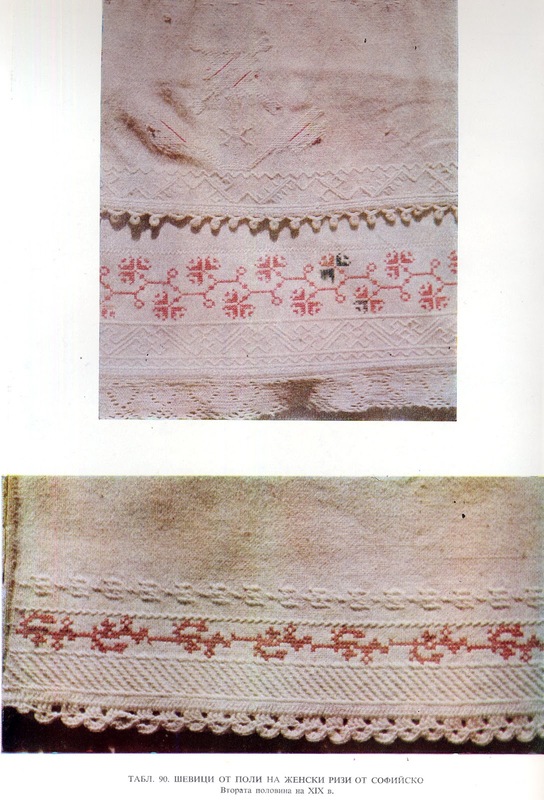 Here is an example of the embroidery found on them. 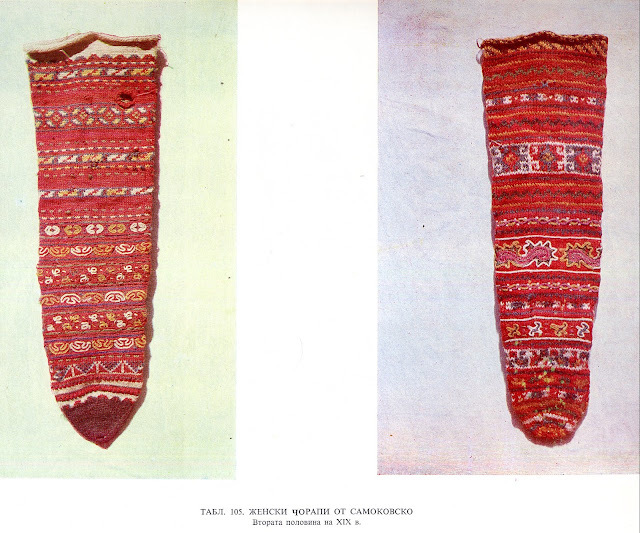 As in other parts of Bulgaria, colorful knitted stockings and moccasins, called either opanci or tsarvuli, are worn. 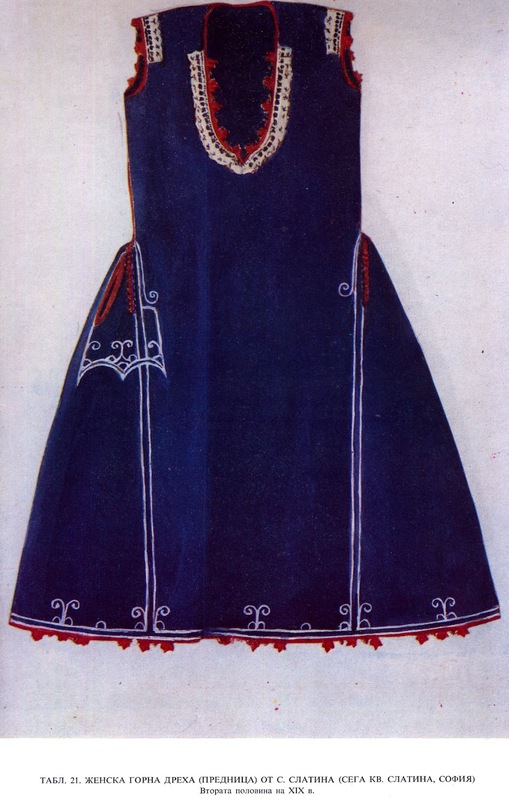 The embroidery on the chemise is very rich and varied, and I will devote my next posting to it. I am sorry that I have not written much lately, but I am going to keep at it more steadily now. Thank you for reading, I hope that you have found this interesting. I will close with some more images of this costume. 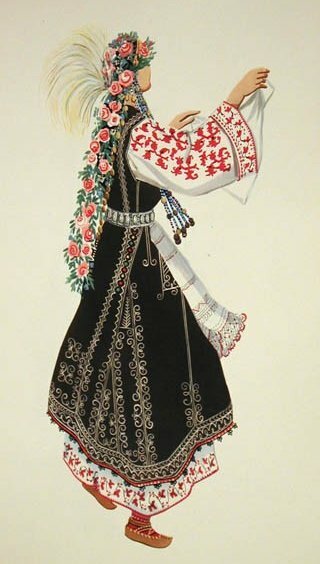 There is a website, called Balkanfolk.com which has many items from Bulgaria available for purchase, including stage quality costumes, and this is one which they have available. You could do better contacting a specialist, but the quality of these is good enough for most purposes. Gorgeous! 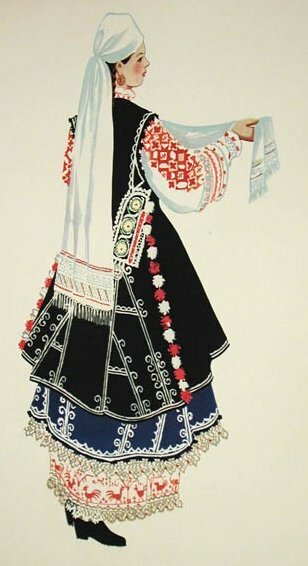 Thank you for all your interesting posts on folkwear! I think you did smart resolution the moment when you picked up this topic of this article. Do you as a rule write your blog entries alone or maybe you work with a writing partner or even a helper? I generally write alone, although i do consult with people who are knowledgeable about particular regions. I have met many people who know a lot about their particular area, and they have been very helpful. Do you have expertise to lend?